Seb Priaulx had a near perfect winning weekend with his results in the two races at Oulton Park in the 2017 Simpson Race Products Ginetta Junior Championship, with his team mate Tom Gamble extending his series lead. But he needed it, as arriving at the circuit he found that all points had been forfeited from the previous meeting as punishment for him and two teammate’s cars having engine technical infringements. Along with fellow JHR Developments drivers Matt Luff and Harry Dyson, the trio were adjudged to have contravened Championship Regulation in post-event scrutineering checks, and excluded from all Thruxton results, and points equivalent to two race wins: the Dronfield-based team are appealing the penalty. Armed with a new engine, Priaulx planted his Ginetta G40 on pole-position, at the lights Priaulx lead off the line and just disappeared, setting the race fastest lap to be nearly 4.5 seconds ahead at the flag. “We got everything right – I got the gap off the start, I could not do any more, so I just relaxed, I wasn’t under pressure, it was easy for me”. With a grin, Priaulx beamed, “I want to thank Ginetta for the engine they gave me – it was awesome and I’m over the moon”. 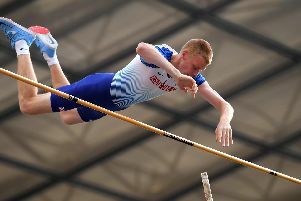 Adam Smalley and Dyson went off together, re-joining towards the back of the field, where Dyson remained but Smalley did get up to 13th-place. Ginetta Junior Championship-leader Tom Gamble steadily moved from grid 7th to finish 5th reinforcing his lead advantage, “I Just keep working my way up to the front as I’m looking for consistent podium results for the Championship”. Another front-row start for Priaulx had him take the round 9 lead on the opening lap and a re-run of the earlier race, setting the fastest lap on his way to another win. Dyson, from 3rd, dropped to 4th and held that position to the flag, with Smalley doing similar, starting 5th finishing 6th. Gamble had an eventful race from grid 7th, moving to 5th on the opening lap, staying there for three laps, until a clash caused him to tumble down ten places. Clawing his way back two places on one lap, and then a further two places on the next gave him an 11th-place finish that nearly doubled his points lead to 31 points. The elder Gamble brother, George and teammate Seb Perez had a couple of incident-interrupted Michelin Ginetta GT4 Supercup races. Round 7 began with Gamble starting 10th, and soon into 8th, a couple of laps had him in 5th and chasing 4th-place. Before he could get any further, a rather heavy crash midfield brought the race to an early end, “There’s always a bit of drama at this circuit”. Perez started from 13th and got into 10th place by lap 3, holding position until lap 13, he took 9th just two laps before the premature race end. The Safety Car brought a mid-race lull to Round 8, where Gamble started in 5th, and was running 6th until the interlude. Back at race speed he was in 5th until the chequered flag. The 7th round of the 2017 Renault UK Clio Cup did not have the best start for Barnsley’s James Dorlin who started the race from the back of the grid, rather than from 9th, after not making it to the assembly area in time. His team had waited a bit too late to make a call on which tyres to use in the changeable conditions. However, being a rather talented 17 year-old, Dorlin did an amazing job making up 7 places on the opening lap. Within five laps Dorlin had recovered sufficiently to be where he should have been originally – right in the heat of the action in 9th position, where he took the flag. Sheffield’s Sam Osborne similarly started where he finished in 13th, but endured some torrid early laps where he fell back to 17th. A bit of determination mid-race had Osborne recover places to take the flag in 13th-place. Both local drivers would rather forget round 8. Even though Dorlin qualified in 5th-place and made a great start down the inside alongside the pit wall. But he was then squeezed off the track and propelled into the crash barriers, sufficiently hard to bring out the safety car for 3 laps. Osborne qualified in 16th place, although after the first lap he had to pit for a new tyre during the safety car period. At the restart Osborne got up to 13th by the end of the lap, then a Renault Clio rolled on its roof, which brought out the red flags on lap 3 and as the barrier repairs were taking too long, the race was not restarted. Osborne was classified 10th and given the race fastest lap.